I am ready for SPRING! – CPA Theatricals, Inc.
“It Might As Well Be Spring” – is my absolute favorite. Written by Rogers and Hammerstein in 1945 for the film State Fair, it won the Academy Award! Now, when I walk in my neighborhood, I sing “I haven’t seen a crocus or a rosebud….” Stars like Frank Sinatra and Ella Fitzgerald recorded the song, and each gave their own personal twist. My friend Tom Briggs worked on the stage adaptation with the legendary David Merrick. Oh, the stories he tells. “The Lusty Month of May” from CAMELOT. My former boss used to say about Camelot – “too many sets and where can you find a Lancelot or King Arthur these days?” That’s why it is rarely done. But this song is so fun and exciting it celebrates the wonderful rituals that happen in the spring months. “June is Bustin’ Out All Over” from CAROUSEL. Yep, Rogers and Hammerstein again. 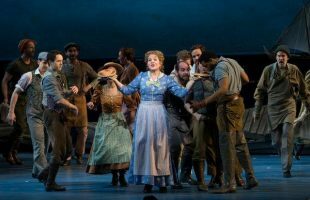 CAROUSEL was revived recently on Broadway with two of my all-time favorites – Renee Fleming and Jessie Mueller. As I sat watching Ms. Fleming singing this song, she did so many trills, and vocal flourishes that the whole audience had smiles on their faces. “Springtime for Hitler” from THE PRODUCERS. I was hesitant to include this but I must admit I am still thinking about the incredible production I just saw at the Paramount Theatre in Aurora. This song, which is the big number in the show within the show, is so irreverent, so sarcastic and lots and lots of fun. Well, with all this talk of spring, I hope it has just been nudged a bit closer.